Irene Moore Davis is the Manager, Continuing Education for St. Clair College, and has been the president of the Essex County Black Historical Research Society since2010She activities including board and committee roles with the Essex County Black Historical Research Society, the North American Black Historical Museum, the Northstar Cultural Community Centre, Alpha Kappa Alpha Sorority, Leadership Windsor/Essex, and BookFestWindsor. The two-hour IELTS information session is designed for ESL/AEP instructors who wish to assist students who are taking the IELTS exam. 3) Support for ESL teachers. Part 1 covers each of the four modules of the IELTS test, providing a general overview of IELTS. Part 3 exposes the participants to a range of free British Council teaching resources that can help them develop their teaching of academic listening, reading, writing and speaking. This British Council IELTS Information Session is recognized by TESOL Ontario as a professional development activity (2 PD hours). Are you looking to learn new skills, engage in more creative work and earn additional income from your skills? Then becoming a teacherpreneur could be for you! Teachers possess many transferrable skills that can be monetized. Teacherpreneurs can continue to teach in the traditional classroom while engaging in other paid work such as online teaching, training, coaching and/or writing. There are many benefits to becoming a teacherpreneur such increased sources of income, travelling at any time of the year, connecting with people around the world, and growing as a teaching professional. In this workshop, I will discuss the steps that I took to transition from ESL classroom teacher to teacherpreneur. I will provide examples of other teachers who have become successful teacherpreneurs and profile the variety of services and/or products they offer. Finally, we will try out an assessment tool to assess our skills, and discover ways to monetize these skills to earn additional income, and engage in meaningful projects and work. Thank you everyone who took time out of their weekend to attend our spring workshop and AGM. Special thanks goes out to our wonderful presenters: Ella from the Unemployed Help Centre; Trish from Windsor Women Working with Immigrant Women; Frederic from Collège Boréal; Elissa from Windsor Women Working with Immigrant Women; and Irena from the Newcomer Reception Centre. 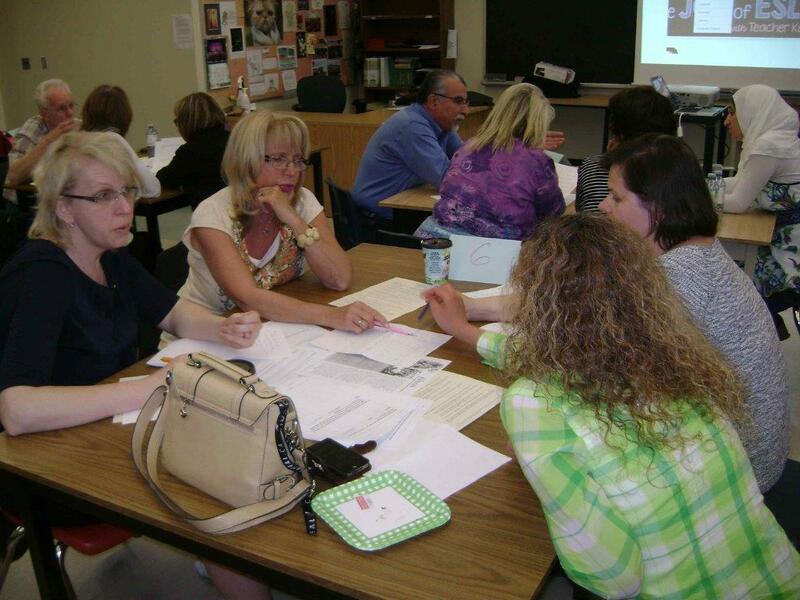 With their expertise we learned about valuable, new or established programs accessible to our students in the Windsor-Essex community. We would also like to extend a warm welcome our newest executive members. Hope to see you all again soon! Our 2017 Spring Workshop will highlight guest speakers from the Windsor community to help us all stay informed and updated on new programs and initiatives that are available for newcomers. 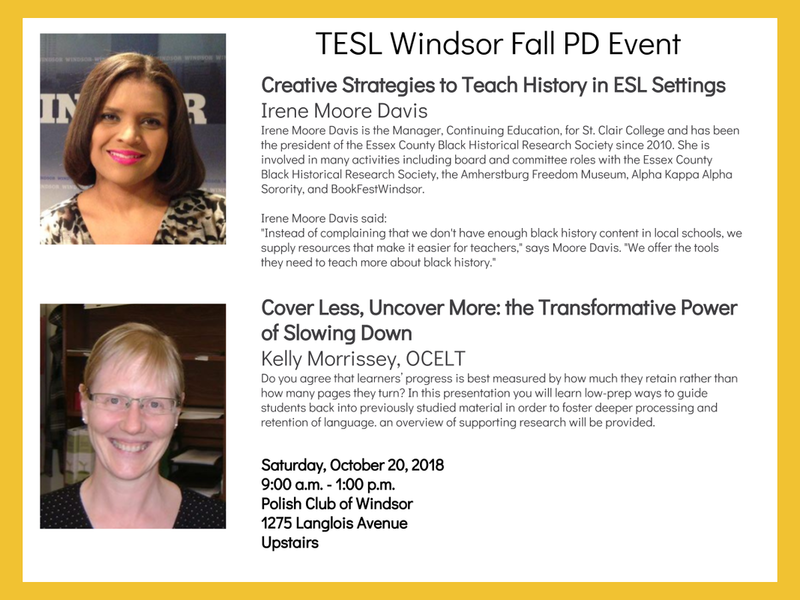 TESL Windsor proudly presents our 2016 Fall Workshop "Connecting Communities through Technology: Bring your Phone." Join us Saturday, November 19th from 9:00 am to noon at Dom Polski 1275 Langlois Ave. Completion of this workshop will grant you a certificate good for 3 P.D. hours. This workshop will feature a special presentation by W5's NAP Drumming Circle, a relaxing intermission of chair yoga with Ritu, and a light lunch to wrap up. Please take a moment to like us on Facebook and follow us on Twitter. 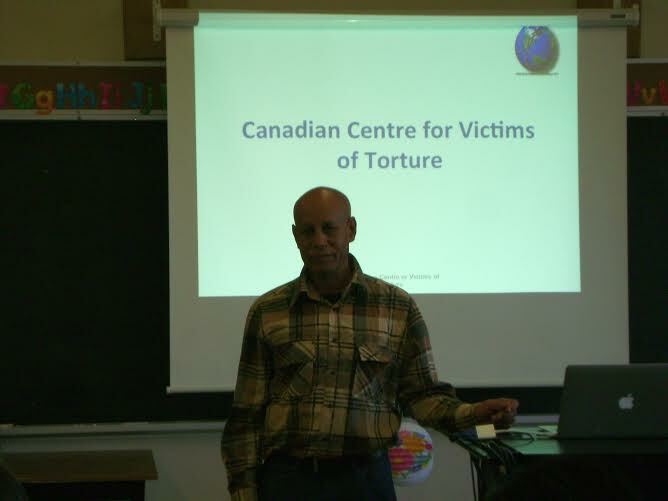 Abdul Abubaker presented to us on the effects of torture and other aspects of victimization. He gave a very comprehensive presentation on the what a person suffering from "trauma" might look like and behave like in our ESL classrooms. He presented wonderful strategies and insight that we all were able to take away with us and implement immediately. 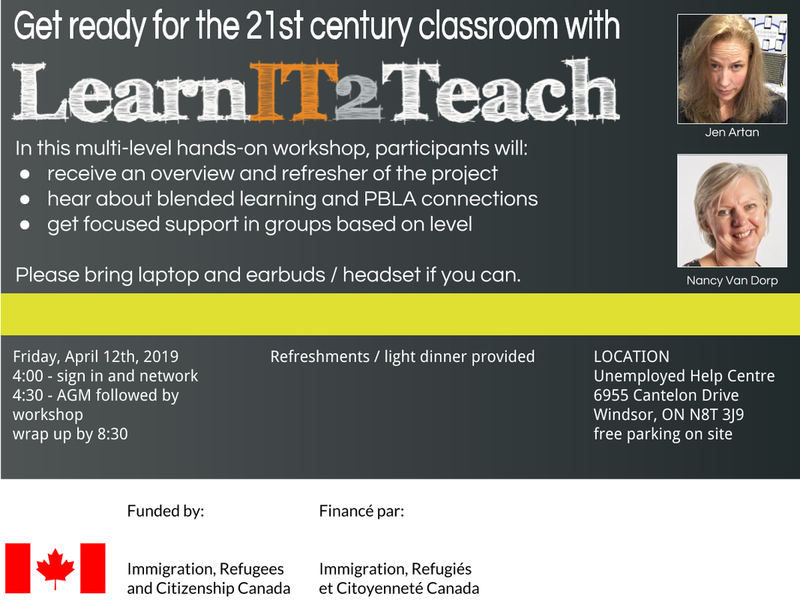 We, as the front-line receivers of refugees who may have suffered immense trauma, need to be aware of how this impacts on a student's ability to learn. ​Jennifer Elizabeth Alexander of Infinite Life Learning guided us on a journey toward well-being and positive mental health as we learned important mindfulness strategies. In this powerful workshop involving rocks, apple slices, mandalas, sprigs of sedum freshly snipped from the garden and six minutes of guided meditation, we learned first-hand how mindfulness can benefit us and our classrooms. Have you read "A Year of Slow: One Teacher's Implementation of 'Back to the Well' " in the conference issue of Contact Magazine? Building on John Sivell and Chirawibha Sivell's TESL Ontario presentation, John Sivell and Kelly Morrissey fleshed out their 2014 Toronto workshop, giving the more than 50 attendees a chance to apply the ideas with a variety of texts ranging in difficulty from ESL Literacy to CLB 5+. The templates that Kelly has been using in her classes since adopting the practice of 'slowing down, turning fewer pages, and engaging learners more deeply' are available on her website at www.kellymorrissey.com under FREE RESOURCES - BLANK TEMPLATES. Feel free to use and edit them as you see fit. Monica Zacharias of the Thames Valley School Board demonstrated to a full house why and how she has implemented PBLA in her classroom. 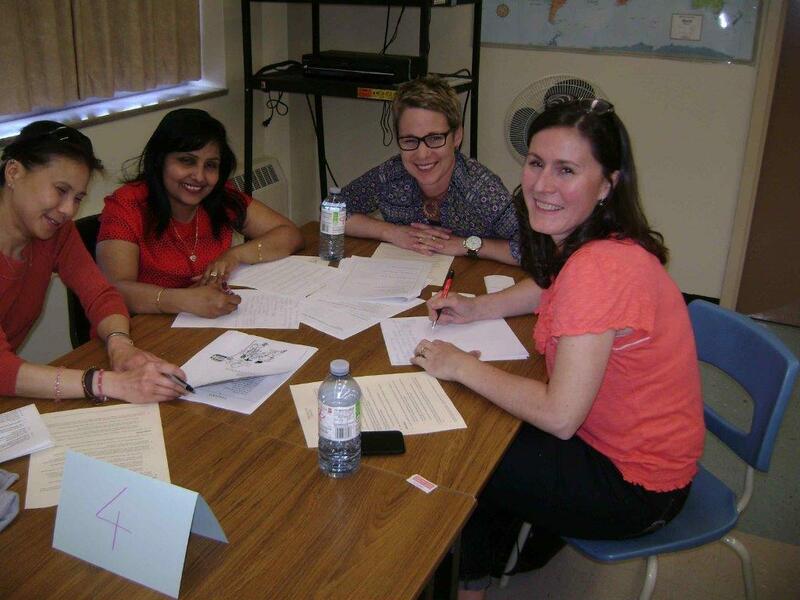 In one of two concurrent break-out sessions, Sally MacDonald of the Language Assessment and Resource Centre made resource sharing a la 'Speed Dating' a lot of fun. The tables even had candles and mints for the 'daters.' In the room next door, meanwhile, Robyn Lambe received a standing ovation for her coverage of two powerful websites for teachers: LiveBinders and LessonWRITER. One attendee commented, "Robin was on fire tonight." 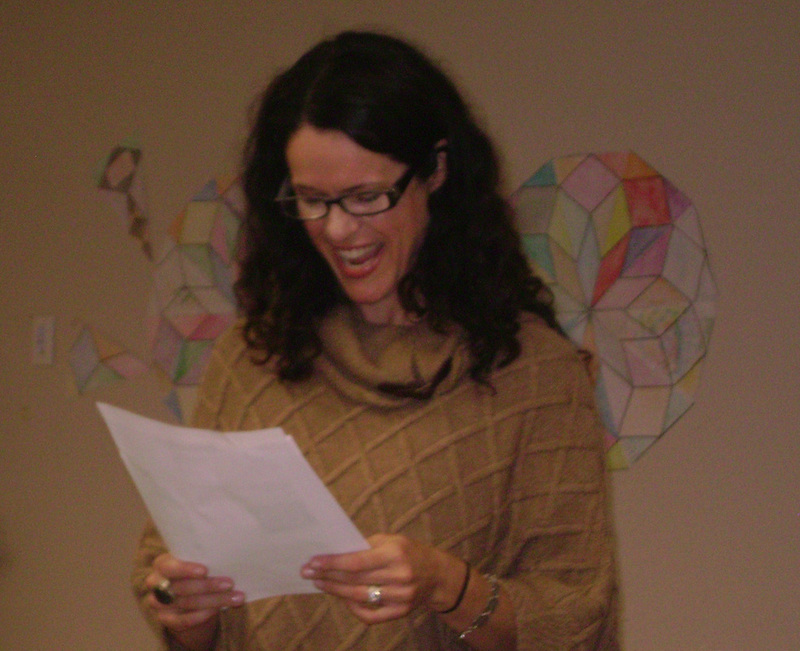 Presenter Kelly Morrissey has been blogging since 2006 and has used blogs in LINC teaching for four years. The hands-on workshop was well attended and, in spite of less than perfect cooperation from the internet server, garnered positive feedback from many who came. To learn more about starting a classroom blog, contact Kelly at kmorrissey@ymcawo.ca. To peek at her classroom blogs, visit Kelly's Literacy Class or Teacher Kelly. She also has a web log aimed at peers in the field of TESL. Click HERE for the main handout. In preparation for integrating local environmental stewardship into classroom curricula, TESL Windsor workshop participants donned gloves and rubber boots to clean up Sandpoint Beach in east Windsor (see below). Although we in Windsor live in an area surrounded by water, very few people take responsibility for taking care of the water surrounding us. Presenter Christina Klein-deRoy has been involved with the Great Canadian Shoreline Cleanup--an initiative that germinated in British Columbia in 1994--since 2007 and has been a coordinator for many shorelines since 2010. Christina made a convincing case for integrating English instruction, acculturation and helping learners gain awareness of the role they can play in being good stewards of the planet on a local level. 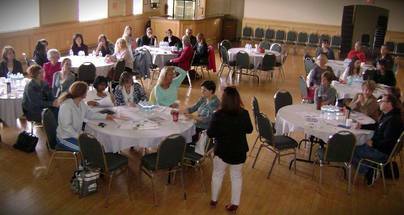 Part two of this workshop was a hands-on experience held on the shores of the Detroit River (see above). Irena Gorelick-Davis, Department Head of English as a Second Language at J.L. Forster Secondary School of the GECDS, accompanied by Pat Watters, brought in many colourful posters created by her students for this excellent hands-on presentation. 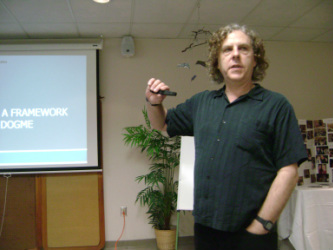 Presenter Ken Lackman of Ken Lackman and Associates shared a framework he developed called Conversation Activated Teaching, which is a step-by-step method that implements the main features of Dogme. It is a totally student-centred way of teaching that begins with the students choosing their own conversation topic for that lesson. 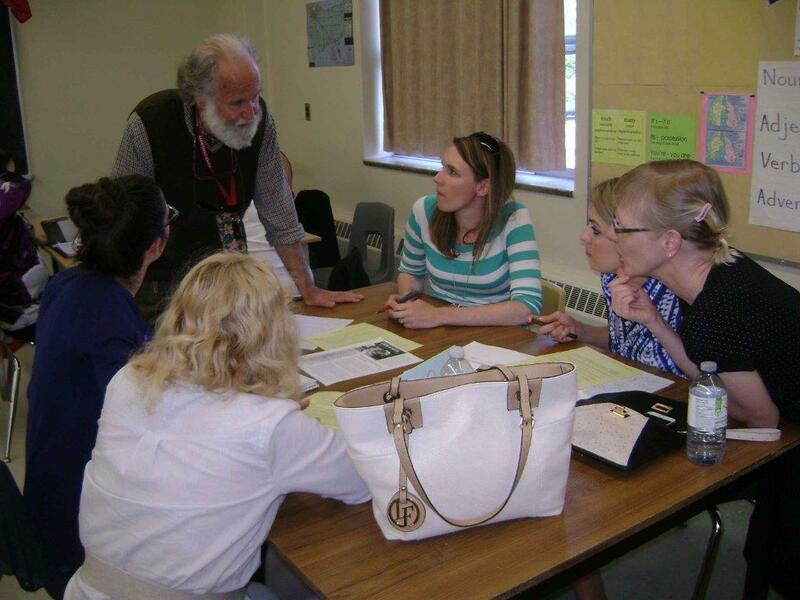 For more information about the basis of this workshop, you can read Ken's publication here. Kathryn Brillinger gave a fun and lively workshop that included the debunking of several commonly held beliefs about pronunciation instruction and accent reduction. Participants of this workshop by Ken Lackman got hands-on experience using corpora data for vocabulary building as well as lots of free templates and handouts made available on the Ken Lackman and Associates website. Jim Papple came all the way from the Niagara region, where he is president of TESL Niagara to deliver this well-attended presentation.